It's all a part of daily life, and probably the best place for visitors to experience a little of local color. Eric Jou tells us more about the ubiquitous night markets of Taiwan where both natives and tourists mingle to shop, have a meal, chat and relax. The night is hot and humid, just like any other summer night at Taipei's Datong district. Thousands are squeezing into a narrow back street off Ningxia Road, and the night is filled with gleeful shouts, beckoning cries and the scent of sizzling food. No, it is not a block party, or a carefully orchestrated public relations event. It's just another normal evening as people gather to celebrate the age-old tradition of the Taiwan night market. From tasty pig innards to oyster omelets and the local version of toad in the hole, the Taiwan night markets draw foodies from the local neighborhood as well as visitors from abroad, especially from the Chinese mainland. These night markets, basically groups of street vendors in any given locality, are a staple of Taiwan nightlife. They offer everything from food to tourist souvenirs and game stalls. "Night markets fill a very important role in Taiwan," says Lin Ting-kuo, head of the Ningxia Road Night Market Association. "In Taiwan, convenience is very important, and the night market offers convenience in many ways, from offering fast and cheap food to hungry businessmen, to providing a nice venue for the family to get out and have fun." Lin says the hospitable nature of the Chinese people in general is part of the reason why night markets have become such an integral part of Taiwan's culture. 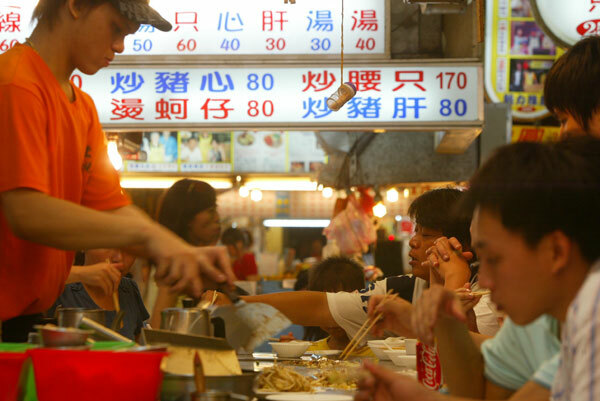 "Many people head out to night markets and dine directly at the food stands or stalls," says Lin. "In doing so, they can chit-chat with the stall owner, and these conversations give a sense of familiarity and belonging, and that makes night markets places that people feel at home." Lin's Ningxia Road Night Market, like many of Taiwan's night markets, started out as a place where people gathered. Some of the more famous night markets began life on streets in front of temples. In the case of Ningxia Road, the night market began during the Qing Dynasty (1644-1911) when vendors gathered to sell iced tea and various snacks inside what was called the Yuanhuan Gardens. 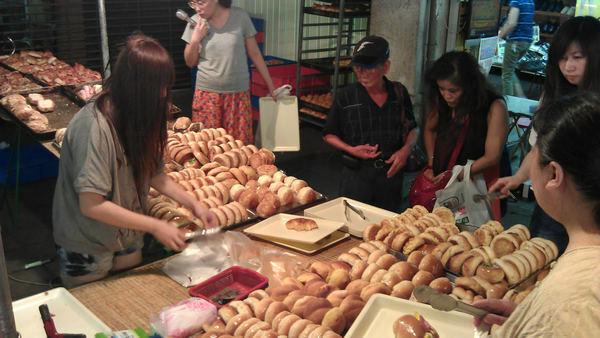 A pile of freshly baked savory and sweet pastries attract a crowd of eager regulars at the night market. The gardens were by a busy six-way crossroads and became a popular spot for people to gather, a fact that enterprising businessmen soon noticed, and started selling refreshments. During the Japanese occupation of Taiwan, the Japanese built up the area surrounding the gardens and the vendors were forced to move to a nearby street - Ningxia Road. When the Kuomintang retreated to Taiwan, they began regulating street hawkers. Currently, all hawkers in Taiwan have to be licensed or risk breaking the law. While night markets operate legally in public space, their existence hasn't exactly been easy. According to Lin, night markets operate on a fine line. While they boost the local economy of the neighborhood, they also draw the ire of residents who want a peaceful night's rest. The typical hours of a night market start at 6 pm and end around one or two in the early hours. And then, there are some that have faded and disappeared due to various reasons, such as botched attempts to improve and relocate them. Taiwan's most famous night markets, the Shilin and Shida night markets, have become shades of their former glory. The Shilin night market, located in a snake-like alley lined with residential developments, was forced to move the majority of its food stalls indoors, making it lose much of its appeal. Shida night market, also located in another residential area, also felt the effects. According to James Parng, chief of the Longquan neighborhood and Shida shopping district, Shida night market has shrunk from having about 300 stalls to a little more than 180. He says the drop has affected business, but only because the market is now smaller. "Shida is still very vibrant, we still get loads of people coming here," says Parng. "Many come to see what's left and are surprised to see the market still very much there. Loads of tour buses drop off tourists from the Chinese mainland." The impact tourists from the Chinese mainland have had upon the Taiwan night markets have been very profound. Parng and Lin both say that it was immediately obvious that cross-Straits tourism has opened a steady flood of visitors eager to experience this Taiwan tradition. Taiwan blogger and foodie Camie Tao says the night markets are the best way for foreigners to learn about Taiwan culture. "If a tourist only has a few days in say, Taipei, they can't physically go to all the special local restaurants," says Tao. "But with night markets, they can stroll down the food section and sample a little of everything. Basically, they can eat and taste the local food culture at one spot." Tao, a regular on Taiwan television's food shows, says the success of the night markets owes a lot to their ability to cater to what Taiwan residents want. Tao cites the example of Eslite, one of Taipei's most popular bookstores. "Eslite became what it is today because it catered to what the customers want. Customers wanted more than just books, they wanted coffee and food, and one-stop shopping," says Tao. "Night market patrons wanted more than just food from the night market, so the markets adapted and have become one-stop entertainment locations." One thing that makes night markets particularly interesting is the fact that they are special to Taiwan, Tao says. While many places on the mainland have night markets, they are not the same spectacles found in Taiwan. Parng also attributes this uniqueness to the Taiwan way of life and culture. "Night markets are a special part of the local night life," says Parng. "Compared to night clubs, a night market is a very family oriented affair." For 23-year-old Taiwan resident Candy Fan, night markets are an important part of her life. Fan recalls growing up in Taipei and visiting the various night markets with her parents. "I really liked going to the night markets when I was younger, in fact I still love it now," says Fan. "I used to love to play the games, like fishing for prawns, catching fish with a paper net and shooting balloons with darts or a BB gun." For young people like Fan, the night market has become a place to hang out with friends. The affordable food and vibrant atmosphere are attractive, and Fan says she and her friends visit night markets at least once or twice a week. "The night market is a part of my life," says Fan. "It's a part of my culture and an inseparable part of Taiwan life." Unique to Taiwanese culture, "night markets" are evening carnivals of food and frolic, strolling and sightseeing -- and all across this island nation night markets rule. Families come to nosh or nibble, college students come to shop for cheap clothes and snap up new DVDs -- sometimes pirated -- and foreigners come to see Taiwan up close and personal. Italy is Italy, the Greek island are the Greek islands, but there is nothing quite like Taiwan's famous -- and infamous -- night markets. Now an enterprising film director in Taipei, Tien-Lun Yeh, 36, and his screenwriter sister, Tan-Ching Yeh, 34, have cobbled together a street-smart and savvy feature filmed titled "Night Market Hero." The film was released earlier this year and did boffo box office in free and democratic Taiwan, now hitting 17 cities in communist China, where Chinese audiences are eating up the free-wheeling Taiwanese way of life that they are denied in the land of Mao. Think "Cinema Paradiso" in Taiwanese form. Think Francois Truffaut on an Asian holiday. Think that you too could become a night market hero, if your very life depended on it. It's that kind of film. night markets: the fried chicken chefs and the fried steak chefs. There's also some trouble with the local mafia boys, lots of romantic scenes of love and angst, and touching scenes of family strife and family reconciliation between the generations. And don't worry about the language of the film -- it's shot in both the Chinese and Taiwanese languages -- with English subtitles on its DVD that are very well written. "The movie is a quaint and somewhat predictable melodrama, yet it brought me to tears on several occasions," said one critic. "Not just tears around my eyes, but tears that actually streamed down my cheeks and to the corner of my lips that I could taste their saltiness." You don't have to be Taiwanese to enjoy "Night Market Hero." Even the Chinese in Beijing and Shanghai are rushing to see this scrappy little film from across the seas. The story goes like this: set in a fictional Taiwanese night market called "888" -- a lucky number among superstitious Taiwanese folk -- the family film focuses on a night market's hardworking food vendors, whose livelihood depends on their business savvy, as well as the local delicacies they sell. Enter the gangster element and plans of a Taipei construction boss to buy the land the night market is on and throw the vendors away, and you've got a good versus evil film that speaks directly to local audiences in Asia. The film is also winning hearts and minds -- and plaudits -- in Japan and North America. Welcome to the New Taiwanese Cinema of 2011 and beyond, which translates well overseas as well. Ang Lee will be proud to see what his countrymen are achieving now in cinema. "Every night the night market merchants come out to make a living, smile and laugh as they tend to the needs of their customers," gushed a Taiwanese critic who now lives in North America. "But behind every stall, behind every stand, is a story of hardship, of real life, of pains and sufferings, of family and complex pasts. These people are all brought together by the foods they sell, by the customers they can attract, and by the fact that every one is simply trying to make a living from what they can do best -- whether it is frying chicken steak, cooking beef steak, selling bubble tea or pirated DVDs." "The night market embodies a colourful and central part of Taiwanese food culture and community life," she added. "And the street vendors, with their strong work ethic and dedication, with their sweat and bare hands, keep the many memories alive. The sight and sounds of food and games bring people together, and can also bring people back to their childhoods years, filling not only empty stomachs but also contented hearts with feelings of nostalgia and longing." "Old songs from my own childhood, and the comic use of the Taiwanese language and cute hand-puppets (another important part of local life for many there) all touched a part of me, and made me realize that even after so many years of living away from my homeland, I am still very much very fond of Tawian, my Taiwan, and its people -- and of course, the many mouth-watering delicacies there." "Night Market Hero" is that kind of movie. I've seen it five times already, in just a week and I can't get enough of it. I hope it makes it to the North American market, too. The Miaokou night market in Keelung is Taiwan's friendliest night market with the tastiest food, but no candidate won the title for the best environment, reports said yesterday. The Tourism Bureau under the Ministry of Transportation organized the contest to find the best night markets in several categories. Miaokou shared its accolade of the friendliest night market with its rival from Lotung in Ilan County. As for taste, it shared the prize with the Fengchia market near the university of the same name in Taichung, even though some jury members criticized the latter for the presence of too many fried foods, reports said. Two of the markets originally thought of as the favorites, Liuho in Kaohsiung and Shilin in Taipei, were both rewarded for their charisma while Liuho also won the Internet public prize. The management of the Kaohsiung market said it was considering 20 percent discounts to thank the public for its support. Huahsi Street in Taipei's Wanhua District, once renowned for its snake blood, won the award for the nicest night market to walk around in. The category of most environmental night market was established to encourage the markets to recycle trash and oil, said Wayne Liu, the deputy director-general of the Tourism Bureau. Only two markets, Ninghsia in Taipei and Chunghwa Street in Fengshan, had registered, but neither made the grade, he said. Liu praised Miaokou for its separation of garbage, but the Keelung market had not registered to compete in the environmental category. Liu was one of seven members of the jury, which also included writers and media personalities. Food critic Han Liang-lu said she approved of the absence of a most environmental market, since the traditional night markets still used too much plastic and styrofoam, which was good neither for the environment nor for consumers' health. At the announcement of the results yesterday, President Ma Ying-jeou said that night markets were the best representative of the people's economy. The fact that they even attracted the attention of the foreign media helped raise the knowledge of Taiwan internationally, he said. A total of 30 markets registered for the competition, though each night market could only compete in a maximum of two categories. The Ninghsia market won the award for the most original marketing for its regular staging of performances, while the Wenhua Street market in Chiayi City was recommended for the long history of some of its stalls. Click here for booking on Taipei Night Market tours from $50 p.p. inc dinner!